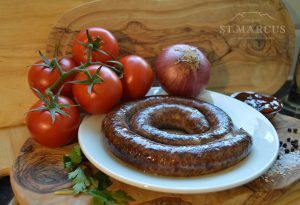 Home / Blog / What is Boerewors? Lots of people without any South African connections do not know what Boerewors is. 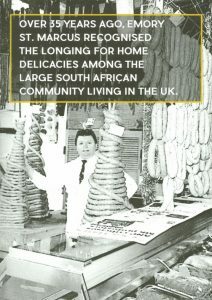 So here is the lowdown on a very tasty sausage, hugely popular on any South African BBQ or Braai (and how to cook it). We make it here in our South England manufacturing house, so read on, come in and see us then you can try it for yourself. The name comes from the Afrikaans words boer (“farmer”) and wors (“sausage”). It is thought that the original recipes would have come from the early migrants to South African brought with them from the Netherlands. The sausage is usually formed and presented in a large spiral – very similar to the Cumberland Sausage that we have in the UK. Cooking Boerewors over a Braai (BBQ) is a strong patriotic tradition in South Africa culture and is often associated with national holidays. The sausage is made from coarsely ground beef which is typically combined with ground pork. The natural fat content of the meat will keep it moist during the cooking process. The unique taste and aroma of Boerewors comes from the generous amount of Coriander, Nutmeg, Cloves, All Spice and Black Pepper. We make it in two sizes (thick and thin) so you can choose your preference – same filling but the lager size will need slower cooking. Have a good pair of tongs ready so you can turn the sausage easily without it breaking up. Intact the casing will retain all the juicy flavours around the meat ready for your first bite. Delicious. Only apply some direct heat at the very end if it needs a little more colour.